Is it illegal to hang something from my rearview mirror in Texas? 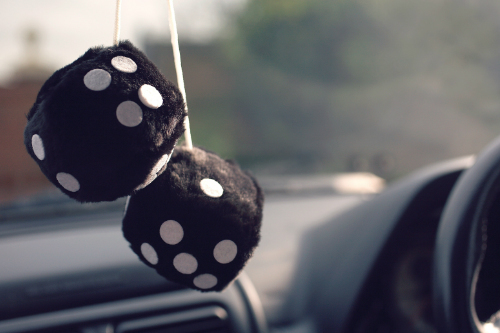 Home » Tips and Tricks » Can I get in trouble for hanging items from my rearview mirror? Can I get in trouble for hanging items from my rearview mirror? Whether you want to hang an air freshener to keep everything smelling clean or a sentimental item that puts a smile on your face when you hop in the car, you may want to think twice about hanging anything from your rearview mirror. We get a lot of questions about whether or not it is illegal to have objects hanging from your rearview mirror in Texas. We break down the law below. While there are no laws that specifically prohibit Texas drivers from hanging objects on their rearview mirror, drivers can get pulled over and cited with a ticket for violating obstruction of view laws if the item in question is prohibiting them from seeing properly out of their windows. It’s best to keep your rearview mirror clear of objects while driving for an optimal view of the road around you. Note – this blog is for informational purposes only. For the most accurate and up-to-date information on Texas driving laws, contact your local police department. Hanging objects are not the only thing covered under the obstruction of view laws. Packing your vehicle’s cabin or truck bed too full of tall objects, window stickers, or even snow and ice that hasn’t been scrapped of your windshield could all be cause for an obstruction of vision violation. Before shifting into drive, we like to take a few seconds to look around and make sure we have a clear view of the road from all windows and all angles. Not only will this ensure that you can see properly, but it will also help you avoid any trouble with local law enforcement. Keep following the Coast to Coast Motors blog for more automotive tips and tricks and be sure to stop by one of our dealership locations the next time you are in the market for a high-quality used model. What is hydroplaning and how can I prevent it? This entry was posted on Monday, March 25th, 2019 at 2:17 pm	and is filed under Tips and Tricks. You can follow any responses to this entry through the RSS 2.0 feed. You can skip to the end and leave a response. Pinging is currently not allowed.